*Press Samples* Hi guys! 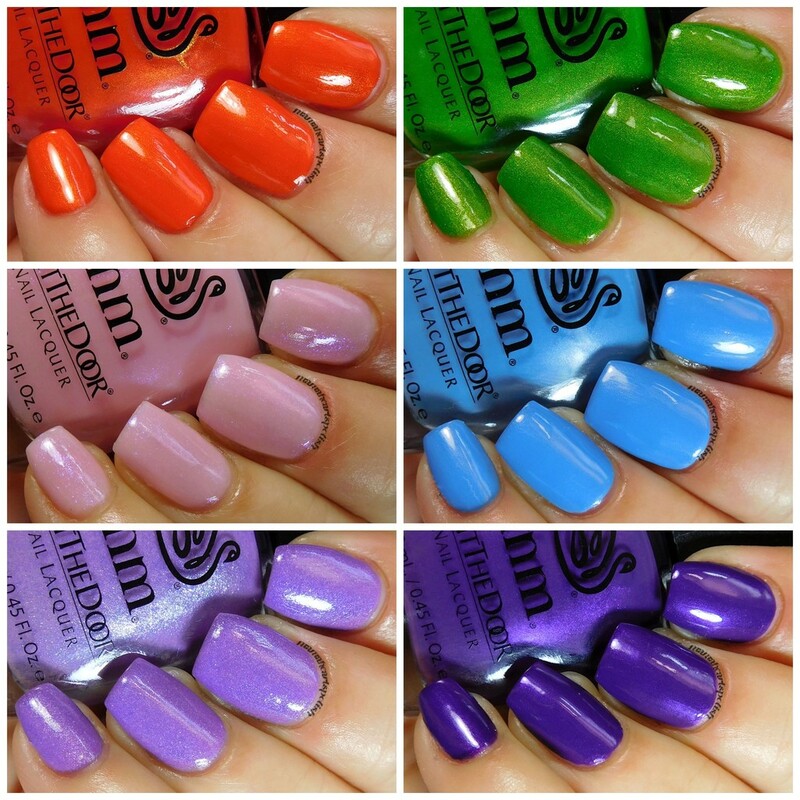 Today I have swatches and a review of the latest collection from INM Out the Door Nail Lacquer called The Future of Polish, inspired by The Fifth Element. The collection consists of 6 shades in shimmery finishes. LeeLoo - bright red orange with golden shimmer. Swatch is 2 coats with Out the Door top coat. Formula is a sorta crelly consistency, not a full on creme, with a bit of that squishiness of a jelly. It's a bit on the thinner side and I had some slight staining of my skin after removal, but not of my nails. Survival of Earth - bright green jelly with gold shimmer. Swatch is 2 coats with Out the Door top coat. This polish has a more jelly consistency, while also being very pigmented. It's sheer on the 1st coat but completely opaque on the 2nd. Formula is a bit on the thinner side as well, but it has that squishy jelly feel to it when dry. I had slight staining on my skin after removal, but not on my nails. Ice Borg - a pale pink jelly with purple-blue shimmer. Swatch is 3 coats with Out the Door top coat. I'd say the shimmer in this is maybe even glass flecks or some type of color shifting micro flakes. Formula is very sheer and thin, for the swatches I applied 2 thin coats and then a 3rd thicker coat in order to reach opacity. I could easily wear this as a special effect topper over other colors as well. The final look is super shimmery and iridescent. It's hard to capture on camera, it's definitely one of those colors you need to see in person in order to fully appreciate how pretty it is. Photos are a bit on the darker side, I photographed them in indirect light in order to try and capture some of the shiftiness. Humanity - light blue with silvery shimmer. Swatch is 2 coats with Out the Door top coat. This one has a thicker creme formula, but also has a more frosty finish due to the shimmer. You want to watch out and be careful when polishing as to avoid too many brushstrokes. Mystical Stones - light purple creme with a blue shimmery glass fleck finish. Swatch is 2 coats with Out the Door top coat. This one was hard to photograph accurately so I did have to color correct on Photoshop to the best of my abilities. It photographed very blue when it is in fact a purple shade. It has a nice thicker formula full of shimmery glass flecks. 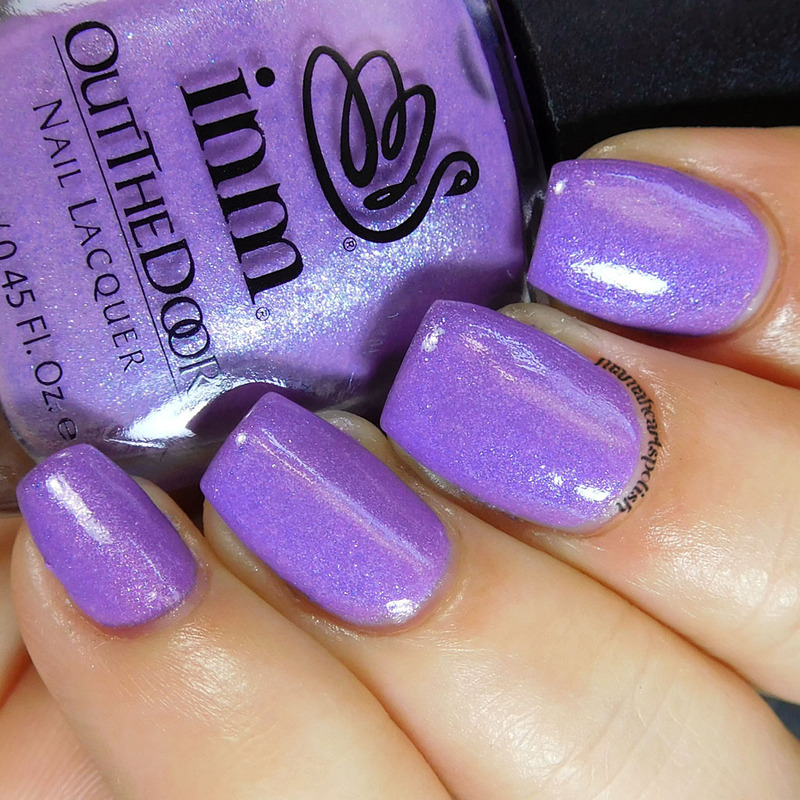 Futuristic Fantasy - bright plum with a hint of purple-red shimmer. Swatch is 2 coats with Out the Door top coat. This one has a nice thicker creme formula, with an almost metallic glow. It was also hard to photograph accurately and I had to color correct in Photoshop since it showed up blue. To give you an idea of the color, it's similar to SinfulColors Let's Talk, or Zoya Savita (with top coat, since Savita has a matte finish). 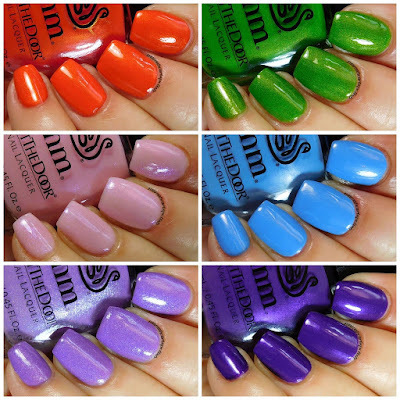 The Future of Polish collection is available now at www.inmnails.com and are super affordable at only $3. You can find INM on social media on Instagram and Facebook and with the hashtags #inmnails and #inm. It's been a few years since I saw The Fifth Element, swatching these polishes are making me want to watch it again! What did you think of this collection? I think my favorite was polish was Survival of Earth, although overall I think these are all great. INM sent me these polishes in exchange for swatches and an honest review. 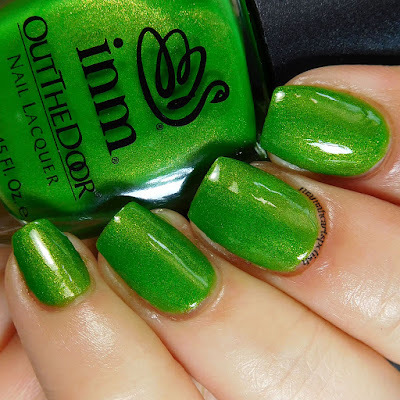 9 comments on "INM Out the Door - The Future of Polish Collection - Swatch & Review"
I'm so glad you mentioned Let's Talk. I was going to ask if that purple could be a dupe! Not an exact dupe, since Let's Talk has a very obvious metallic finish and this one doesn't. But in terms of the color, they are almost the same. Whoa. These shimmers are gorgeous and only $3?! I wish I could buy these in person. Oh wow, I'm loving Ice Borg. The shimmer in these is great! LeeLoo might be the stand out to me though. Great price! I didn't know this brand made polish, I thought they only did topcoat! I like all of these, they have great shimmer. Great collection! THat orange is stunning.